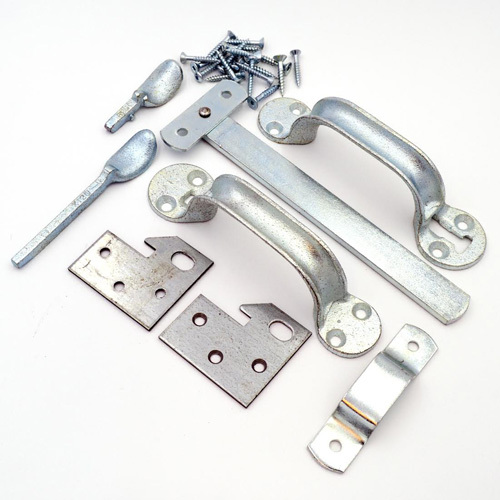 This cast iron thumb latch is zinc-plated for superior strength. They can be used for doors that are 1¾" - 2¾" thick. With this thumb latch door system put into place, you will then be able to open your doors from either side. Cut ⅝" x 1¼" slot through door 2⅞" from the edge, at desired at height. Screw the other handle to the opposite side of the door, with the long thumb piece resting on top of the short thumb piece. Handle with long thumb piece is placed higher on the door than the other handle. The extra long thumb piece is to be cut off to suit the thickness of the door. Edge of Door to Center of Slot Spacing: 2⅞"